First Report from 17 July 1942 - Description of the Camp. The camp represented itself the form of a wheel, surrounded by barbed wire; guards inside and outside - Ukrainians are placed densely. The trains from the station go to a siding, enclosed by barbed wire. There the Polish railway workers are replaced by Germans. The German engine driver drives the train to the disembarkation point which is between two barracks: on the right for the men and on the left for the women. There the Jews have to remove their clothes. Then "to the bath", which is in the third barrack. There the extermination is carried out, probably by an electrical floor. Afterwards, the corpses are carried by trolleys to a trench behind the fence, which is 30 metres deep. This trench was dug by the Jews, and all of them were subsequently liquidated.. The Ukrainian guards are lavishly provided with money and stolen valuables. For a litre of vodka they pay 400 zlotys, for a sexual contact with a girl 2,000 zlotys, jewelry or diamonds. Of course all witnesses of the crime will be killed in future. 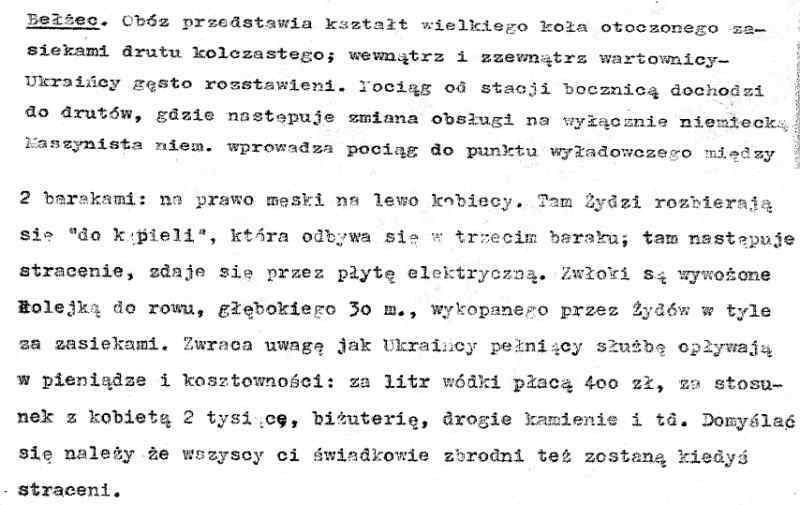 Second Report from the end of July 1942. The death camps. The main camps in the Generalgouvernement are Belzec and Sobibor in Wlodawa county. The camp in Belzec was not active in the last decade of May because of the horrible stench from the decaying bodies of thausands of murdered people. Since 3 June the camp is active again. Every day two transports arrive: One at 6 a.m. and the second at 4 p.m.. Immediately the hangmen organize the "disinfection and bath", from which nobody is coming back alive. On 13 June a revolt happend in the camp when the Jewish Sonderkommando, who was ordered to remove the bodies of the murdered women and children, saw the horrible scenery of upright standing gassed victims in the gas chambers, embracing themselves in death. The Sonderkommando attacked the guards who then alarmed the whole camp's staff. 4-6 Germans were killed, and almost all Jews. Nearly everywhere in the Generalgouvernement massacres against Jews happened. In mid-June around 4,000 people were deported from Krakow. There more than 150 people were shot on the spot. In Tarnow 400, in Nowy Sacz 500, in Lukow 50 (on 20 and 21 July), in Szczebrzeszyn more than 70, in Bilgoraj 60, in Tarnogrod 48 etc. These are fragmentary numbers, given as example for the last weeks.